What If Mueller Wants Manafort to Flip on Podesta, Not Trump? He steps down after Manafort is indicted (Gasp!) and it’s said that Manafort is indicted because Mueller wants him to flip on somebody. (Gasp!) What if it’s Podesta and not Trump (Gasp!) as I posited 35 minutes ago? (Gasp!) Can you imagine, at CNN, if this actually is the case? What’s gonna happen? RUSH: A quick question and then want to get back to the phones — well, get back; we haven’t gone yet. Start on the phones in just a second. Quick question: What would you think of the observation that Paul Manafort has been indicted — i.e., being punished — for taking millions of dollars from Vladimir Putin without giving him uranium in exchange? The Clintons took millions of dollars. They got millions of dollars. Bill got a $500,000 speech fee. The Clinton campaign — are you aware of how many millions of dollars the Clinton Foundation got in this uranium deal? It’s tens of millions of dollars. They got money. They gave up uranium. They haven’t been indicted. But Manafort has been. Let me ask, when the Clintons gave up — the uranium was the property of the United States, right? What did the United States get for selling that uranium? Are the Clintons the only people in America who benefited from that deal? The Clintons benefited from the sale of 20% of the U.S. uranium supply to a Russian-related firm. The Clintons were personally enriched twice, via the Clinton Foundation and the Bill Clinton $500,000 speech fee, and the Canadian guy acting as the broker here. But it wasn’t their uranium. What did the USA get for it? Well, I mean, the answer is “nothing.” But why? Why did the Clintons get to sell it? Why do they get to be involved in the transaction to sell? To the phones. We’re gonna start Williamsburg, Virginia. Brian, glad you called. You’re first today. It’s great to have you with us. CALLER: Good afternoon, Mr. Limbaugh. As you taught me, intelligence guided by experience, the Republicans we know are not going to do anything with sitting down a special counsel. They’ve done everything in their power to work against Mr. Trump. We have evidence now that they’ve funded Fusion GPS to work on this dossier. I don’t see any other way — and also that all of these hearings are an absolute waste of time. You notice Mueller didn’t have any hearings but yet he’s got an indictment. So I wanted to ask you is it possible that President Trump can request or order a special prosecutor to be put in place, and that gentleman’s name needs to be Joseph diGenova and have him start an investigation into this Fusion GPS and this Uranium One deal? Does he have the power to do that? RUSH: Well, this is tricky. ‘Cause the president runs the Department of Justice, theoretically. Well, constitutionally he does, but there is this invisible barrier that is supposed to prevent political involvement and corruption. Of course, the barrier doesn’t exist when the Democrats are in the White House and run the DOJ. Whether the president can request an independent counsel to look into Fusion GPS, no, I don’t think so. That has to be the attorney general. How did this special counsel come to be? Anybody wondering about that? You know, Sessions had recused himself. And Trump forever believes that if he hadn’t, there wouldn’t be a special counsel. But Sessions recuses himself, which means the deputy by the name of Rod Rosenstein, was now in charge of the DOJ for anything related to the so-called Russia collusion investigation, and there’s nothing there! Folks, there is nothing there! it is impossible to be more emphatic. There’s nothing to this! They haven’t produced a bit of evidence over a year. So he called Mueller and said, “You and Comey want to look into this? I’m sorry, you can have Comey, but you can’t –” they’re best buddies. “You want to look into this?” And so that’s how Mueller came to be. I don’t think Trump calling for another independent counsel to look into Fusion GPS is either the answer nor do I think that that would in any way be how it would happen. This Fusion GPS thing is right where it needs to be. Devin Nunes with the subpoenas has uncovered their bank records and these congressional investigations are heading down the track. We’ll see where they lead. But it’s got the rats scurrying for cover. Janet in San Antonio, Texas. You’re next. How are you? CALLER: Hi, Rush. I’m so glad to be on your show. CALLER: My husband and I love your show. You know, I’m wondering, you know, with the fact that Manafort was arrested and Mueller seems so out of control, it seems like the IRS, the CIA, and the FBI, they’re going rogue. I mean, is this something that you think we could be headed for a coup? Or if Hillary had been elected, a coup could have been possible? RUSH: This is the coup. 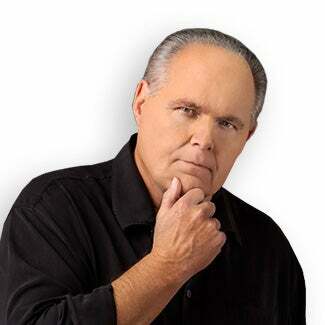 RUSH: If Hillary had been elected, none of this would be happening other they’d try to still put Trump in jail as a message to the next outsider “don’t dare try this,” but this is the coup. You know, loosely speaking most people think of coups as little tinhorn dictators in the jungles of Central and South America getting hold of the army and a couple of jeeps and firing mortars on the presidential palace like Castro did against Batista in taking over. That’s a military coup or junta. But this is a coup. The establishment is and has been trying to overturn the results of an election. They’ve been trying to disqualify. They basically are trying to nullify it because the outcome is something they don’t want. And so the quest here, the never-ending pressure on Trump that continues to ratchet up, this is the coup. And Trump is, you know, fighting back against it. It’s a silent coup. It’s been going on for months and months and months. Robert in San Diego, great to have you with us, sir. How are you? RUSH: Even took some clothes. RUSH: Took Manafort’s favorite Friday night suit, from what I understand. CALLER: (laughing) I think you’re right. And then you can ask the question, if he’s really serious, if you know these people that we’re dealing with, did he raid Podesta’s house, Wasserman Schultz, Hillary, Robby Mook, Susan Rice? This is why Jeff Sessions needs to take over this investigation immediately, because the one thing that you know is going on right now, there’s no doubt about it, as you would say, don’t doubt me, they’re destroying evidence every day that they get before the evidence is collected. CALLER: A simple subpoena doesn’t work. RUSH: You think that they are not pursuing Podesta, that they’re not pursuing “Blabbermouth” Schultz because they didn’t perform predawn raids on their properties like they did Manafort? RUSH: Oh, I see what you’re saying. You’re saying that Mueller is protecting them? CALLER: He’s not going after ’em like he did Manafort. I mean, Wasserman Schultz’s hard drives could be in the Intracoastal Waterway. I mean, it’s ridiculous to assume anything is being done properly, and that’s why that evidence needs to be collected. I mean, we know the Clintons destroy devices, erase emails. I mean, they have a history of that. Are we gonna let ’em, you know, get a three- or four-week head start on us again? I mean, it’s bothersome. RUSH: Well, I can see why you would think this. If you’re seeing Manafort being the victim of a predawn SWAT team raid and other people who might be investigated for similar things not being. You know, I don’t pretend to know what’s going on here, and I don’t pretend to know investigative techniques. The question was asked of me, “Do you think the indictment of Manafort could actually be in pursuit of Podesta?” You know, could they actually be trying to get Manafort to spin on Podesta? The prosecutors cannot leak grand jury proceedings, and that’s essentially what’s happened here with the leak that there were indictments coming, sealed indictments over the weekend. The Manafort team is made up of Clinton and Obama lawyers, and there is one of the members, his last name is [Andrew] Weissmann, and apparently he has a signature technique as an investigator, and it’s the predawn SWAT team raid of one of your targets. But as to what that action against Manafort could mean for other players, I’m not even gonna hazard a guess. I’m glad you called.